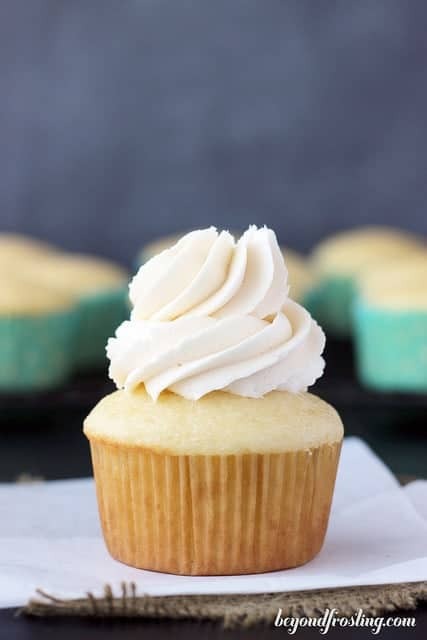 Cupcake Research- Tips for bakers! 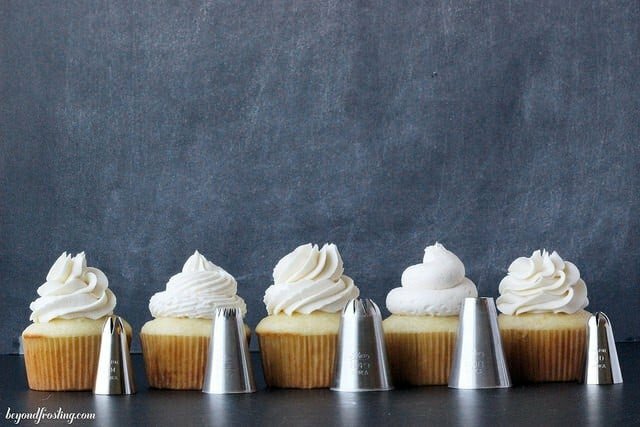 Everything you need to know when it comes to baking cupcakes. 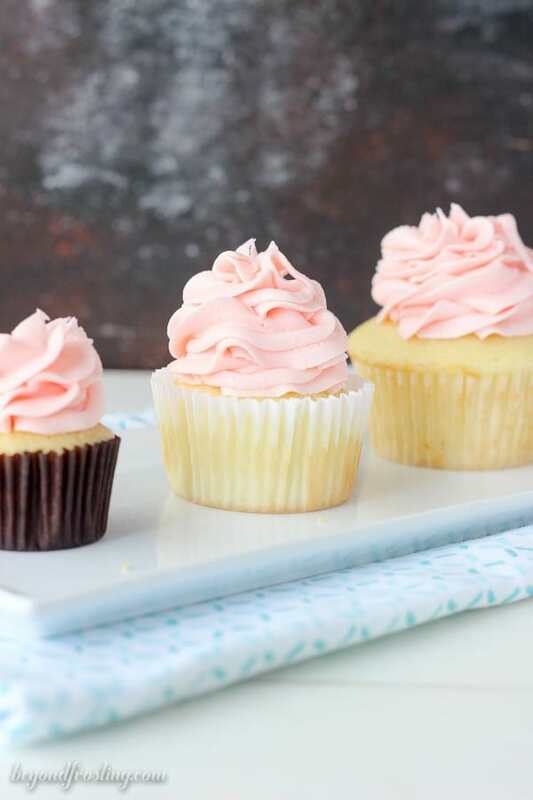 This is your go-to guide for how to bake the perfect cupcakes. Over the last several years I’ve baked a LOT of cupcakes and I am not ashamed of going through the checkout line with 30 boxes of cake mix. You will find quite a few cake mix recipes or “doctored” cake mix recipes on my blog because I think that everyone deserves to be a successful baker and that is the first step. If you’re looking for something more homemade, definitely try my homemade moist vanilla cake recipe. 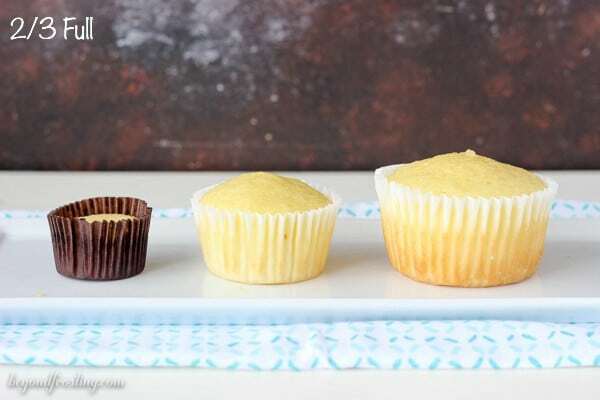 In this post I explore the difference between different types of cupcake pans including dark nonstick versus light nonstick, mini versus regular versus jumbo cupcake pans and the tools to achieve the best results. If you’re looking for the perfect frosting, don’t worry, I got you covered there to. Are you looking for decorating tips? I’ve got some of those as well. What’s the difference between ⅔ full and ¾ full? What does ⅔ full even mean? Let’s talk about it. These are my personal preference and opinions that I’ve learned from all the baking I do, but please keep in mind that everyone’s tools and equipment will vary, especially ovens. I know that my oven is about 15 degrees off, so I use an oven thermometer and offset my oven temperature accordingly. The more and more baking I do, I learn that size, baking time and measuring batter is especially important. First lets talk about pans. In this post, I refer to two types of pans. I use a Wilton dark non-stick pan and an Wilton Recipe Right Nonstick-12-Cup aluminum pan. Both are non-stick but the surfaces vary. If you enjoy baking as much as I do, I am sure you have a variety on pans in your house. Cookie sheets and cupcake pans are similar in that a dark non-stick pans are great because they are easy to clean, but it doesn’t always enhance the food. Dark non-stick pans will produce a crispy surface on any area it cooks against. 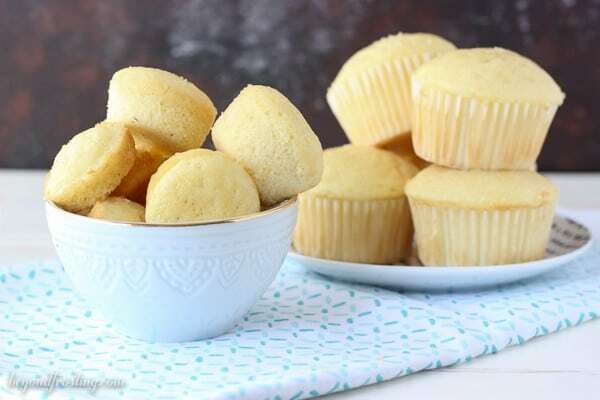 Whether it is the bottom of a cookie or cupcake and even the edges of your cupcake, they will bake up darker and slightly crispier than an aluminum pan. Through my different trials, I did find that the dark non-stick pans will generally result in a better rise when it comes to the cupcakes. My normal go-to cupcake pan is my Wilton Recipe-Right nonstick pan. 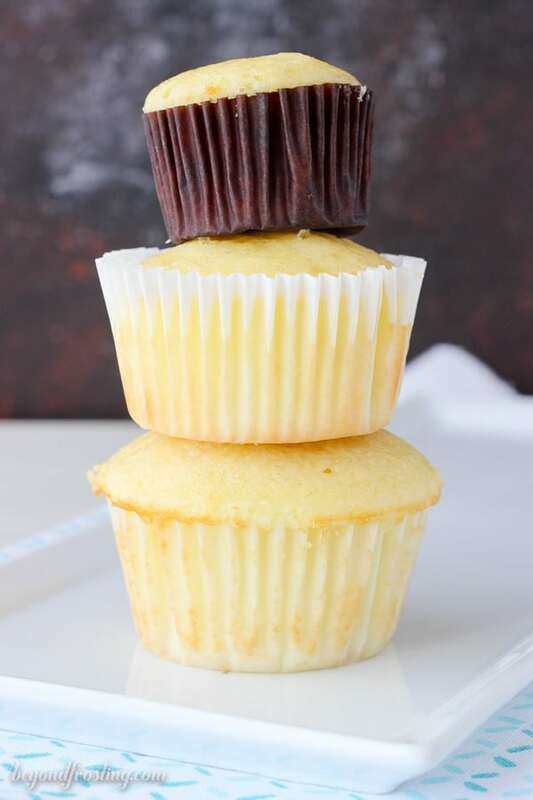 Even though the cupcakes do not rise as high, it prevents the cupcakes from getting too dark around the edges or the bottom. As long as the batter is well mixed and evenly measured, it tends to produce very consistent results. So let’s start with your standard size cupcake pan. For this test, I use a large cookie scoop, which is 3 tablespoons worth of batter. This will fill your liners 2/3 full, and this results in the highest yield of cupcakes, about 22-24 cupcakes based on your standard 15.4oz cake mix. In my oven, these bake 14-16 minutes depending on the recipe. 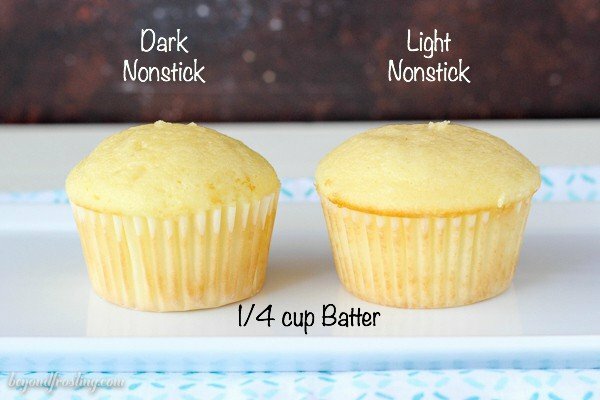 If you looking for slightly larger cupcakes, then you will want to fill them ¾ full, which equates to ¼ cup of batter. 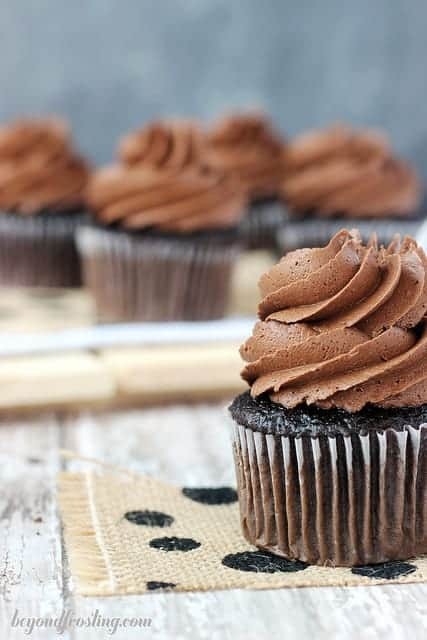 I love the way these cupcakes look because they rise over top of the liner and they are nice and full. However, because you’re using so much more batter in each cupcake, this produces a lower yield, around 16-18 cupcakes. 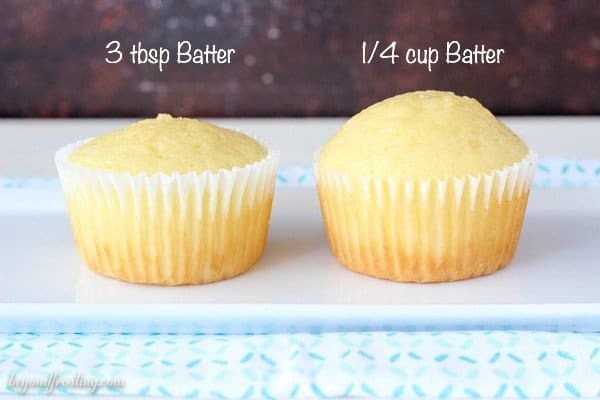 Since there is more batter in these cupcakes, you will need to adjust the baking time accordingly. In my oven this is 15-18 minutes depending on the recipe. I also conducted tests using the same pans but eliminating the cupcake liners. I am a fan of using the liners, because I think it helps insulate the batter a bit more, which means the cupcake bake more evenly. It also prevents to edges from getting too dark. If I am baking in bulk, I usually buy bulk white liners. However, when I am looking for fun and colorful cupcake liners, I buy them from Sweets and Treats. 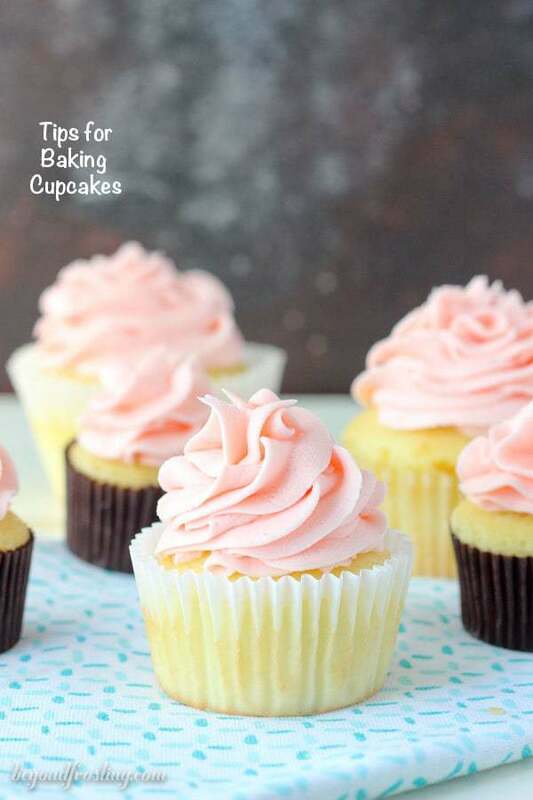 Their greaseproof cupcake liners stay bright and colorful, even after baking because they are GREASEPROOF. That is the secret my friends. If you don’t believe me, you can check out my cupcake section to see if yourself. I think these liners work best if they are filled 2/3 full. If you are going to be baking without the liners, I insist that you must spray your pan or generously grease with Crisco. Even though these are nonstick pans, I find that they release a whole lot easier with the use of some extra grease. Next we can talk about mini cupcake pans. 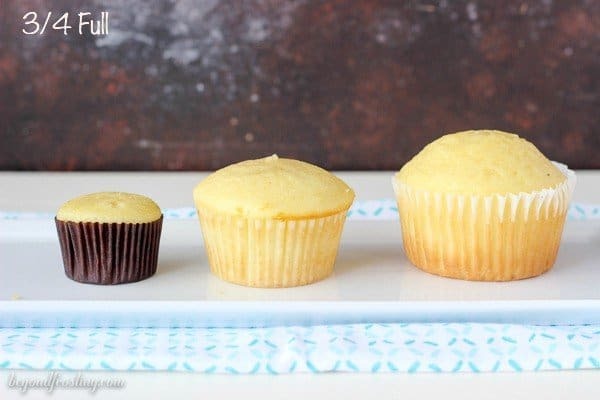 I love a good mini cupcake, but I always felt like the mini cupcakes you find in the bakeries are so much bigger than you get at home. Then FINALLY I found my dream mini cupcake pans from Caphalon. 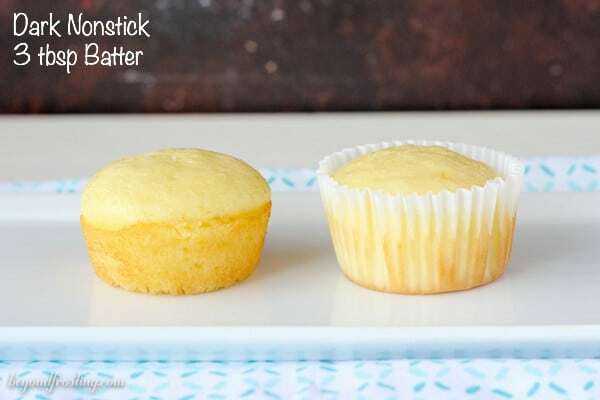 These are deeper than the traditional mini pans you’ll find in the store and the sides are more vertical, which means a skinner and taller cupcake. If you have a standard mini muffin pan, then it is best to use a mini cookie scoop, which is about 2 teaspoons. Since I use my Caphalon pan, then I use a medium scoop, which is 1.5 tablespoons. 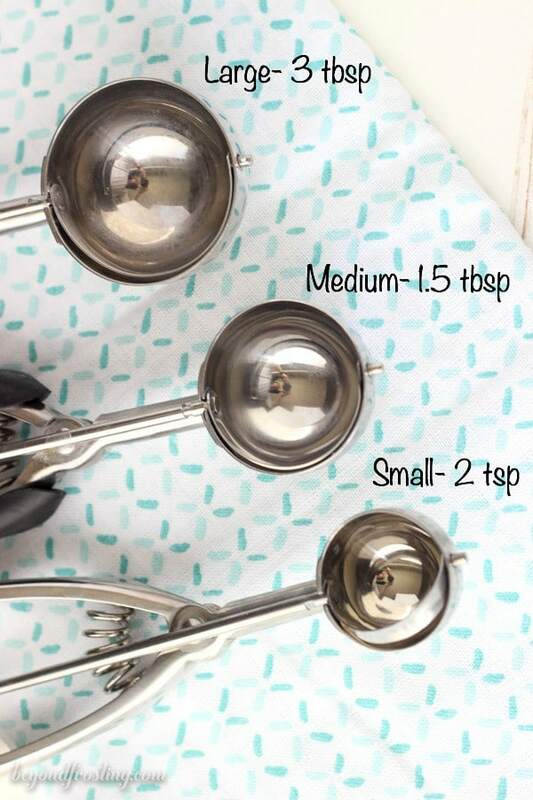 This is also the most common cookie scoop size. Finally there is jumbo cupcake pans. My dad used to make muffins in a jumbo pan; like seriously, he never made regular size muffins. However, I don’t think these are best for cupcakes, they are more like mini cakes! 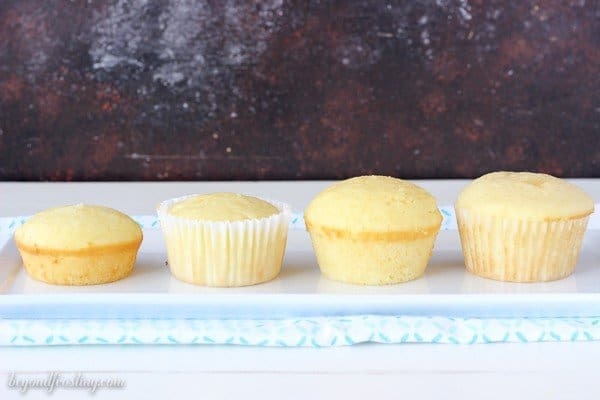 For the jumbo cupcake pans, I conducted 2 tests using 1/3 cup of batter and ½ cup of batter. I found the best results were using ½ cup of batter. However, the baking time is significantly increased when you’re baking jumbo. When I was baking the jumbo cupcake without a liner, I found that they were very misshaped. I know this is a lot of information for to take in, but I also know that there are plenty of, “what does it mean to fill my cupcake liners 2/3 full?”. This is the most common instruction called out in most recipes. My hope is that this will help you guide you to becoming a successful baker. And remember, baking takes practice too! There are more frequent questions I get asked including cupcake liners. Almost all of my cupcake liners from Shop Sweet Treats, which are GREASEPROOF liners. This means that the color won’t fade after you bake your cupcakes. Isn’t that the most frustrating thing when you buy those cute liners at the store and then they are ruined after you bake in them? Not these ones! I also like to buy white cupcake liners in bulk but I usually buy those at cake decorating stores. One thing I always buy online are cupcake boxes (just don’t forget to order the liners). If you have any more question, please let me know by leaving me a comment below! Happy baking friends! All your cupcakes are nice a round. Mine sink! Why? Hi Jenny, it could be a number of things. You batter mix be over or under mixed but the most common reason would be that they aren’t actually baked all the way through in the middle, so they sink just a little bit. Sometimes and extra 30-60 seconds makes all the difference. 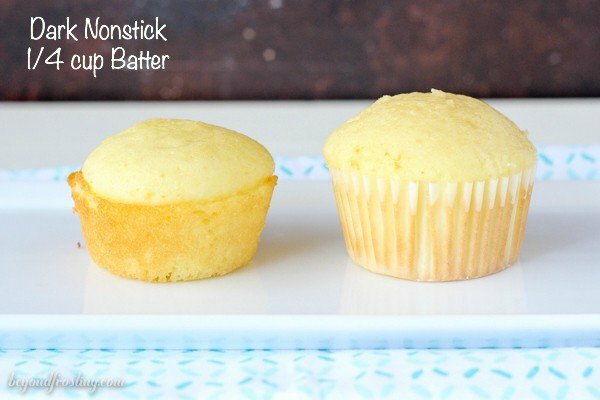 If you use a large cookie scoop for your batter, you will have a more consistent bake time for all the cupcakes. When my father was a kid, he remembers going to a German bakery that had cupcakes that looked like muffins. They had the large crown and were “jumbo” in size. I’ve been playing around with the cake recipes to get the cake portion right for him to taste, but now that I have the recipe right I can’t get the crown top — or even get it to rise right. I attempted the large tin, with six to a pan using the 400/350 approach to get the dome, but instead they sunk in the middle and had no crown to speak of. Before I invest $50 in a special restaurant large crown muffin tin – are there any tips, tricks, or hints that I can try I’m ready to keep trying. The pans were definitely full! I’ll try adjusting the bake temp/time and a bit more baking powder. Let us know how it goes! Maybe try reducing the batter then a little bit in each one, even 1 tablespoon less and see if that helps. When I am testing something like this, I bake 2-3 at a time and play around with the temp and baking time until I find what works. Sounds like you’ve done a lot of that already! When making 24 cupcakes, does it matter how many pans you use to break that # up? And when you do use multiple pans, do you bake them all at once? 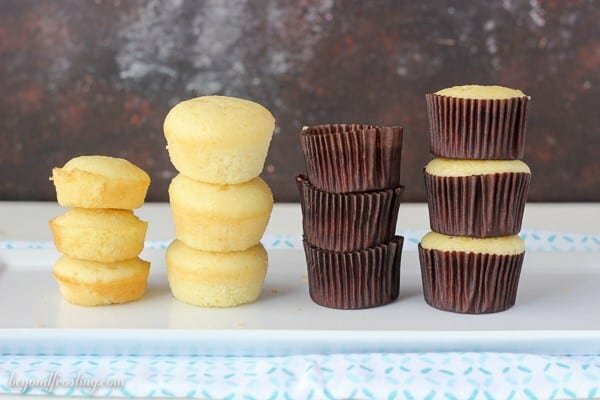 What cupcake liners do you use with the mini cupcake pan you like? I’m looking to make the size of mini cupcakes you find in the bakeries. Hi Tonya, I order the mini from Webstaurant. You need to know the specific dimensions of your pan and order the liners accordingly. Hi there, have you tried repositioning the rack in your oven? Maybe it’s too close to the top of the oven? I recently nakedness cupcakes and they became “soggy” in the bottom of the liner just after about 3 days. I used a boxed cake mix that required oil. Could this have been the reason? Hi Becca, I don’t think that would have been the issue as most box recipes do call for oil. Although I am not sure what would have caused that to happen.